Today sports reporter Tony Jones has ripped into Bernard Tomic after Lleyton Hewitt confirmed he’d been threatened with physical violence by the wayward tennis star. 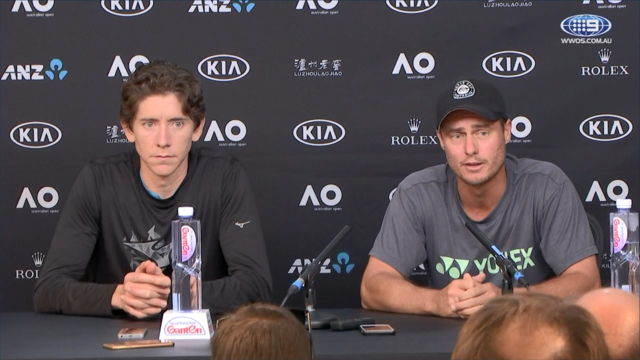 The press conference revelation came four days into an Australian Open that’s been dominated by headlines generated by a reported rift that’s developed between some of the men’s tennis players and the Davis Cup captain. That storyline has taken some of the gloss off an excellent first week on the court for a string of lesser known locals, with five Aussies making it through to the third round and Jones, like many other tennis fans, has had a gutful. “I can’t believe we are sitting here on a morning when we should be celebrating the fact that five Aussies are through to the third round and talking about things like that,” Jones said. “To me, it is very, very sad when you have people like Rod Laver, who the main stadium is named after sitting court side most days, you have got ornaments like Evonne Goolagong, who was just class personified when she played, and yet we have this wave of tennis players who are fortunately on the way out. “I am not having a go at Lleyton Hewitt per se, by the way, I am having a go at the Bernard Tomics of this world. Bernard, pack your bags and go away. “Really, you are a blot on the Australian sporting landscape and the more this is played out, the more Tennis Australia needs to intervene and say, ‘enough is enough’. “I know we (Channel 9) are a corporate partner, (but) Tennis Australia is sitting on its hands and it needs to do something now. Like today. Jones’ spray comes after what was a golden night for Australia with Alex Bolt and Alexei Popyrin advancing to the third round after overcoming the odds to get past highly credentialed opponents. Still just a teenager, Popyrin was dominating French Open finalist and world number eight before the Austrian retired due to injury, down two sets and a break. Then Alex Bolt electrified Melbourne Park with a stunning come-from-behind win over tour veteran Gilles Simon, sending Court 3 into a frenzy as he triumphed in a five-set thriller 2-6 6-4 4-6 7-6 6-4. In his press conference on Thursday night, Hewitt made it clear he was taking into account “cultural standards” when he selected his Davis Cup team and wouldn’t be selecting Tomic while he’s got the power to determine the make up of the team. “For me, it was probably the abuse that I caught from him that, yeah, in the end I drew a line in the sand,” Hewitt said, adding that there was little chance of reconciliation.